We've seen rain and snow showers all week across much of Colorado, but those have been spotty at best, especially for lower elevations. Friday and Saturday our chances for precipitation increase across Colorado, before we may finally dry out a bit and warming up for Sunday. We think that is one of the biggest things you need to know is that Saturday may not be that warm for most of us, as we might be hard pressed to make 70 degrees. Storms will be moving from northwest to southeast. While like previous days not everyone will see the shower activity, but we think these showers and storms will be more widespread over the next 24 to 36 hours. 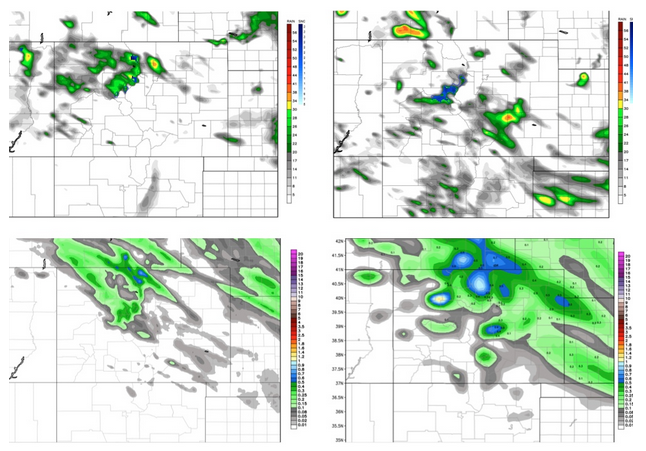 Here's a look at the NAM simulated radar for Friday afternoon (top left) and Friday night (top right). Rainfall totals will vary greatly depending on where the heaviest showers setup. The NAM is a bit drier for totals through Saturday (bottom left), but while the GFS a bit wetter (bottom right), especially over northeast Colorado. Totals will generally range from a trace to no precipitation to about 0.5 inches depending on where the heaviest cell setup. There's not a tremendous support for any of these storms to be severe, but can't rule out some thunder, especially Saturday when CAPE is a little higher across the urban corridor and east. Severe weather will remain quiet nationwide the next couple of days before possibly gaining some momentum late in the weekend across the northern plains. For now expecting Denver to stay mostly dry Sunday, but could see severe storms pop up along the northern Colorado border and into Wyoming and Nebraska. We'll keep an eye on this and make any updates/adjustments to the going forecast as needed. The shower activity and continued cloud cover will help to keep temperatures cool through Saturday, before temperatures may finally climb to near 80 for Sunday. It could very well be that Sunday and Monday are the driest two days of really the next 10 for eastern Colorado. We're continuing to keep an eye on later next week for the return of more active weather for the state. Some of the models continue to indicate it could be a very interesting setup for the region for several days by the latter half of the week -- we'll continue to monitor and have another post soon on the matter.